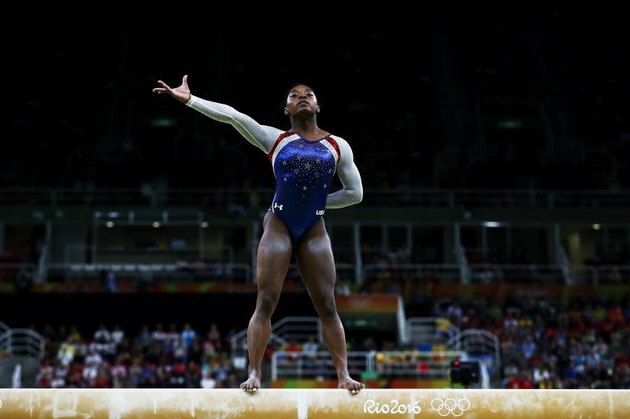 Olympian gymnast Simone Biles gave the world some serious #lifegoals when she killed it at the 2016 Rio Olympics and had the cutest online flirtation with Zac Efron all in the same month. But with the recent release of her new book, “Courage to Soar: A Body in Motion, A Life in Balance,” the brave athlete inspires us all again with an emotional account of being called fat by her coach. Biles, who recounts the tearful moment in 2013 in her tell-all book, opened up about it to Today’s Hoda Kotb. “You overheard a coach say, ‘You know why she crashed? Because she’s too fat — that’s why. How does she expect to compete like that?’” Kotb prompted on air. Biles' experience proves that no one is immune to the pain of being fat shamed — or from slipping (not even Olympian gold medalists) — but it also shows how important the right approach is when trying to help those you love. It actually can make the difference between psychologically harming someone or motivating someone to be better. Thanks for the life lesson, Simone! Have you been fat shamed? Can you believe Simone Biles was spoken to that way? How do you stay motivated? What is the best way to help motivate friends to lose weight or be healthier? Let us know in the comments.